Costa Rica government promotes travel and vacations in Madrid, Spain. From this Friday January 18th, and for three more weeks, several strategic points in the city of Madrid will invite the Spaniards to visit Costa Rica, in order to escape the cold of the winter and the low temperatures in which they are now and, instead, enjoy the good tropical climate that characterizes us. The advertisement shows a surfer in the middle of the sea and enjoying a full sun, on an area of 450 square meters in front of the Plaza de Cuzco, in the central Paseo de la Castellana in Madrid, Spain. The giant fence invites the Spanish to know the tourist attractions of our country, under the slogan “I am Pura Vida. When are you coming?”. Also, the train station of Atocha exhibits impressive images and videos of nature, fauna, adventure activities, waterfalls, beaches and the approaches with the culture that a Spanish tourist will find in this Central American country during their vacation. In this busy station, a promotional video is reproduced more than 1,000 times a day on large format screens and interactive digital screens. In addition, the electric ramps to access the high-speed train of the Madrid-Barcelona route were decorated with allegories, their own designs and colors, inspired by the typical Sarchí carts. The campaign is aimed at a market that is constantly growing. Only between January and December of 2018 more than 69,000 tourists from Spain came to the country. In this way, this Iberian country constitutes for Costa Rica the fourth market for tourists coming from Europe.
" 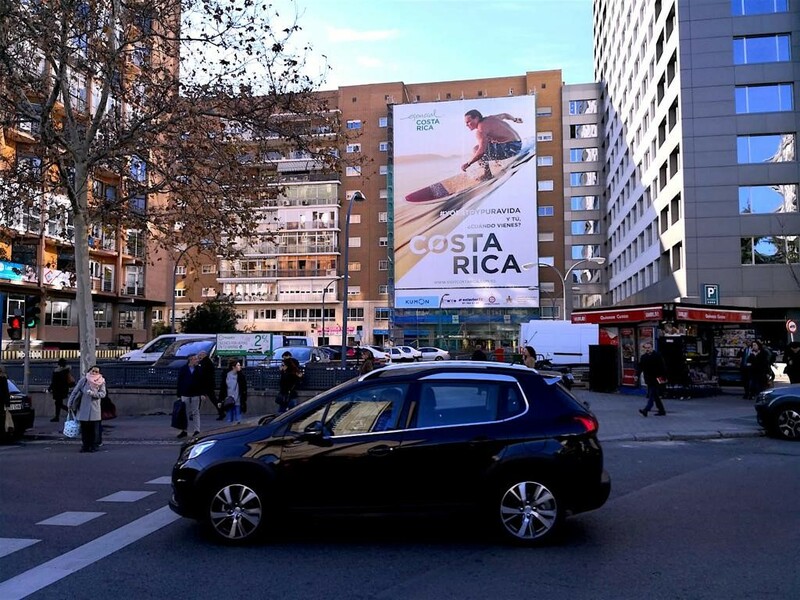 For the first time in history, a positioning campaign of Costa Rica is being carried out as a destination for large format outdoor media in the Spanish market. This allows us to have great reach and strategic high traffic points such as the Paseo de la Castellana and the Atocha station, "said Ireth Rodríguez, ICT promotion manager. This advertising campaign stands out and stands out for the size of the selected formats, the wide visibility, the scope you expect to have and the selected location. For example, the Paseo de la Castellana circulates an average of 60,000 vehicles daily and transits some 285,000 people daily. In addition, the building that was selected to exhibit the advertising gigantography is located in the financial heart of Madrid. For its part, the train station of Atocha reports a daily transit of 1.8 million passengers with a medium and medium-high demographic profile, but above all it burns with the "best prospects" of Spanish tourists identified in ICT research. The investment for this campaign was approximately 90 thousand euros and the actions were coordinated jointly with the support and support of the public relations agency Blueroom in Spain. The momentum of this campaign coincides with the participation of Costa Rica in the FITUR 2019 fair, one of the most important tourism and travel fairs in the world, which began in Madrid this week, from January 23 to 27. According to studies conducted by the ICT, Spanish tourists who visit Costa Rica stay an average of 13 nights and spend about $ 198 per day. The observation of flora and fauna (89%) stands out among the activities that they enjoy the most when traveling through the different regions of the country, as well as the enjoyment of sun and beach activities (87%), the visit to volcanoes (73%). %) and hiking trails (63%), among others. The questionnaires answered by Spanish tourists who have visited the country are multiple respondents. We expect the visit of more European travelers in the next months, thanks to the efforts made in promotion, the participation in Fitur, and improvement of the local product offer of activities and accommodations. If you want to spend your vacations in Costa Rica for the next months, just leave us a message and we will help you with everything!